I’m sorry if this has been asked before, is one cup of peaches accurate? The recipe calls for 1 cup, about 5 peaches, but 5 peaches would be a lot more than 1 cup. Also, ! 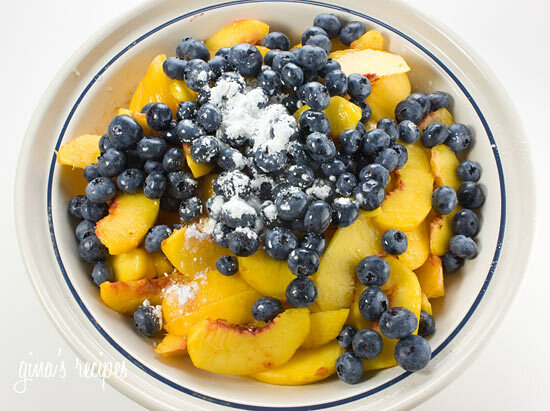 cup peaches and 1 cup blueberries doesn’t sound like it would fill a 9″ pie plate. Sure thaw them first, thank you! I used 1 cuo blueberries and five peaches for a total of 4 1/2 cups of fruit. It was perrfect! Can this crisp be frozen? It is delicious! I just put this in the oven! As other have said, it really didn’t seem like enough fruit. I did one cup of each, but it barely covered the bottom of my pie dish. I really hope it still turns out! This looks like a lot more than 1 cup of peaches. No? How small are your peaches?! I’ll give it a try! I can’t believe it’s only 1 cup blueberries and 1 cup peaches. That’s not much fruit for all of that topping. Can you use Quaker Oat Bran hot cereal for the topping instead of quick oats? Hi Gina, I would really love to try this recipe, but I am allergic to peaches. Is there a fruit I can sub for it or do I just double the blueberries! Thanks for your help! Hey did anyone confirm if it's one cup or one pound of peaches? I'm going to give this a shot tonight… Think I'll split the difference just to see (About 2 cups which will still be short of a pound). Ahh… I think I figured it out! It is supposed to say 1 lb. of peaches. Did that, and it is SO yummy! I love it. Thanks for the recipe! I'm thinking the same as the first two posters. Really? because one peach is almost a cup. Same question here. One cup of sliced peaches equals five whole peches? Hi, I am just curious if this recipe really calls for just 1 cup of peaches, which you say is about 5 peaches. I just sliced up one peach and it's almost a cup. Hi, love this and big raves at home also for your strawberry rhubarb crisp, but I can't get the topping proportions correct. Can you please include the size of the pie plate/baking containers used in the recipes – thanks, that would be a big help! Holy Momma! This was yummy! Thanks! I LOVE this. We made it this weekend as well and went over very well! Thanks Gina!! I use whatever I have on hand. Thanks for this recipe – I can't wait to try it! Just wondering if you used salted or unsalted butter in this? Thanks! I made this last weekend for a bbq and it was fantastic, not to mention super easy! I didn't eat it right out of the oven, but I microwaved individual slices for 10 seconds or so and served it with lowfat Breyers vanilla bean ice cream. Soooo good! Our guests ate it all up :)We also enjoyed your choc chip oatmeal cookies. I make them in triple batches (yes about 90 cookies, lol)for friends and family. Everyone loves them! Made this with blackberries and plums instead. Yummy! Points plus ? What would be the points plus values for this recipe. I want to make this for dessert for my family on sunday ! Do you have the points plus values on this? Maybe I'm not seeing it?? It's usually near the honey or syrup in the supermarket. You can use sugar or honey instead. So happy you feel that way! I am new to your site and I have already made several of your recipes, all of which have turned out amazingly!! Your spices and assortment of ingredients are genius, thank you!! This Blueberry Peach Crisp turned out so yummy!!! I agree with Andrea! I used this recipe and everything seemed to go rather smoothly. I did not have too many frozen blueberries left so I added two table spoons of some freeze dried blueberry powder which one of my friends recomended to me for baking. It was so good I would strongly suggest it! Plus the powder is 100% Fruit, with no additives, so it just added a little blueberry kick to the recipe. Best cobbler I have ever made! My kids loved it! This was the best cobbler I have EVER had!! 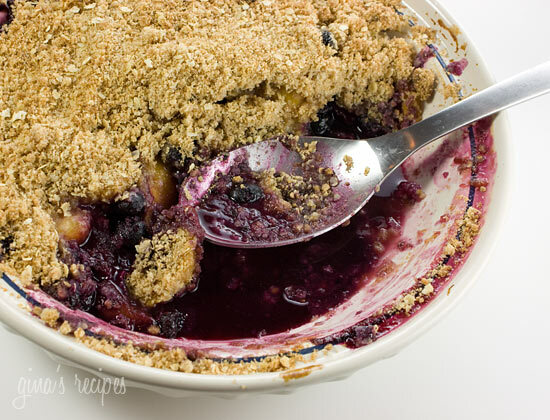 Thank you for this easy to make, and healthy cobbler recipe!! I made this for my husband, and lets just say there were no leftovers the next day 🙂 I can't wait to make again for my friends! I would like to try the Bourbon mashed sweet potatos. I want to try ALL of the recipes, but I think the one that sounded the best were the Pumpkin Chocolate Chip Whole Grain Cookies. Fall is right around the corner, and this just sounds like the most amazing thing to have on a chilly fall evening with a warm cup of hot chocolate. Mmmmmm!! I'd love to try the pound cake. Yummy! Lots of good looking recipes! I'd love the Chocolate Agave Syrup and Blueberry-Cranberry Granola Muffins (I love fiber filled muffins for breakfast wtih peanut butter!). And, the No Bake Cookies would be a great gluten free treat for my sister (She is so impressed when I "bake" for her). Has to be the Classic Pound Cake and the Strawberry Jam. Yummy!! My mouth literally dropped open when I saw the pumpkin chocolate chip cookies…YUM. I just found your blog today-it's great!! I'm excited to try your recipes. On the Xagave site, I would love to make the bbq sauce and ketchup….we use a lot at home and would love to do it in a more healthy way. Thanks!! The Classic Cranberry Sauce caught my eye. I LOVE cranberry sauce – in most any form. I eat it throughout the year. I have a great homemade cranberry relish recipe that is fantastic, and I think the Xagave in it instead of sugar would be great. I am always looking for protien shakes. I would love to try the Chocolate Protein Shake. I'd love to try either the pound cake or the lemon meringue-LOVE both but too many points! The recipe No Bake Cookies made with Agave sounds like the perfect one to make with young children because there is no heating up the oven. I would love to try the Teriaki sauce…there are so many uses for it! Of course the pound cake, lemon meringue, no bake cookies and island painkiller look really good too! I will definately bookmark that site and order! I have never even heard of agave so thanks for the info! I would love to try this! We have diabetes in our family, so we're always on the look out for products to help us transition to no-sugar diets. This would be great! Thanks so much, and the recipe sounds amazing, those pics are drool-worthy. I love agave and would like to get into using it for baking. The Classic Pound Cake with Agave sounds delish! I'd love to try the Pumpkin Chocolate Chip Whole Grain Agave Cookies. They look so delicious! I would like to try the No bake cookies as they are easy to make and sound yummy but with less calories than the regular recipe! thanks!!! I want to try the Pumpkin Chocolate Chip cookies! I would try the No Bake Cookies made with Agave. Definitely a childhood favourite! I would try the chocolate agave syrup. The Agave Strawberry Jam sounds wonderful. my husband loves no bakes! a treat for the entire family! THe Pumpkin chocolate chip whole grain agave cookies look so yummy! I had No Bake Cookies at a friend's house once and thought they were the best invention ever! So I would love to try the EZ Gorilla Poops wth Agave! I would so like to try the Whole Wheat Carrot Pineapple Cake with Agave, because my mom and grandma love carrot cake. I would bake this for our next get together. Thanks! I just found this site and I am very interested in following along with the recipes. I have never tried Agave and would love to try the No Bake Cookies. I would love to try "No Bake Cookies made with Agave" because I thought that this recipes is easy and conveniece. I would love to try the Tangy Agave Ketchup because I am a huge ketchup addict! I'd love to win this!! I would love to try the pumpkin chocolate chip whole grain Agave cookies~Yummy!!!! I would love to try the Classic Pound Cake with Agave!. By the way you're Blueberry Peach Cobbler looks delicious. oh the pound cake sounds yummy! i love me some good cake! 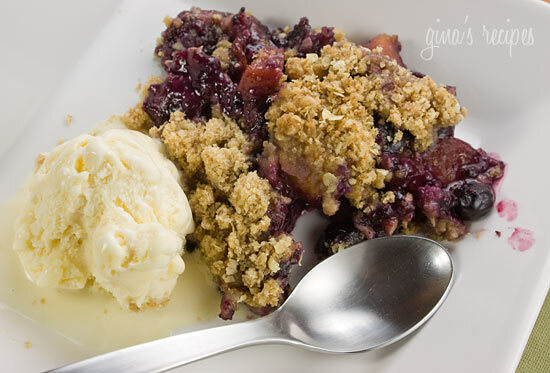 and this fruit crisp looks fabulous…i just happen to have some blueberries that need to be used. OHHHH!!! So many yummy new treats to try — since we're coming up on Fall, the Whole Grain Pumpkin Chocolate Chip Cookes fell right into my lap as a new recipe to try. AND… since I splured on a fabulous carrot cake at the Cheesecake Factory this weekend (! ), I need a healthier fix to satisfy THAT craving — looks like the Pinapple Carrot Cake recipe will work just fine. I just found your site – it's amazing! And some of those Xagave recipes look great! With Fall right around the corner, I'd love to try the Pumpkin Chocolate Chip Whole Grain Agave Cookies. I heart pumpkin. The Strawberry Jam intrigues me, as I have always made it the standard way. And now that my husband was diagnosed Diabetic, I have even great incentive to try alternative recipes.